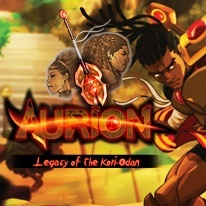 Aurion is an epic action RPG set in a wonderful African Fantasy world! Enzo Kori-Odan, the prince of Zama is a victim of a coup d'etat orchestrated by his brother in-law on the day of his coronation and wedding with Erine Evou. The royal couple is then exiled and decides to go around the world in search of allies. They will especially have to reunite Enzo’s warring legacy in order to retrieve their throne. Beyond retrieving their position, the dethroned Royal couple will precisely discover the geopolitical and existential dilemmas attached to their functions of King and Queen. They will have to find answers in order to secure the fate of Zama. - Epic and strategic Real-Time Fighting, visual evolutive Combos!